When German start-ups feature in media reports, it tends to be companies that have been set up in major cities such as Berlin, Munich or Hamburg.New businesses are also being established elsewhere, however. In the small town of Lüneburg, for example, where Sebastian Waack (a teacher), Jessica Zeller (a media educator) and Kai-Roman Ditsche-Klein (a software developer) founded their company Edkimo in March 2015. Edkimo offers an app by the same name for feedback processes in schools and training institutions. In 2013, the three entrepreneurs came to Lüneburg – a historic Hanseatic city in northern Germany – when they won the Leuphana Business Accelerator competition staged by the University of Lüneburg. All the same, it took them quite some time to turn their idea into a marketable product. On the one hand, the app – which teachers can use to obtain anonymous pupil feedback about their lessons – needed to be extremely easy to use. But on the other, it had to be sufficiently complex for teachers to establish a continuous feedback process. Thanks to the app, teachers no longer need to laboriously analyse paper-based questionnaires. It gives an on-screen summary of the answers to the questions that teachers have sent their pupils via the app. Answers to individual questions are also evaluated automatically. This allows teachers to quickly appraise the situation and respond as necessary. “The whole thing is designed to ensure that teachers get straight into a conversation with pupils about the findings”, explains Jessica Zeller. Looking back, the entrepreneur says: “Edkimo wouldn’t exist without Lüneburg University. We were provided with time, money and know-how that allowed us to make our concept market-ready.”The university financed not only the office and two part-time positions. 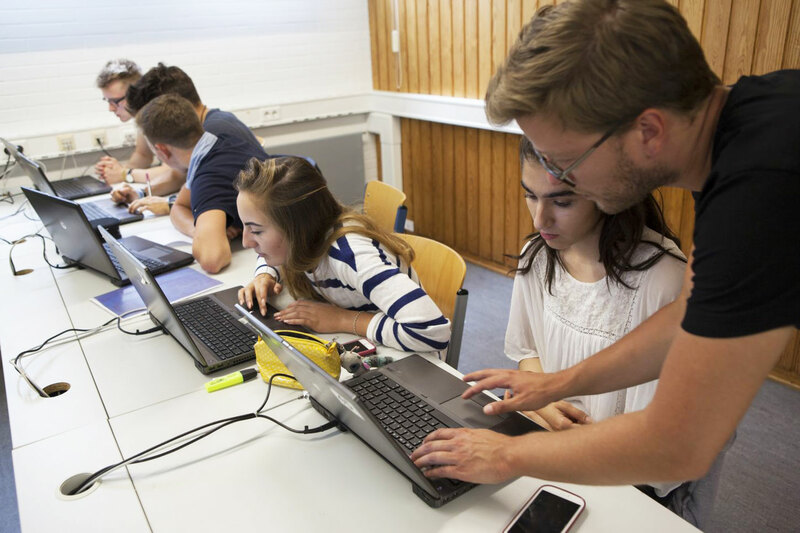 Thanks to its Innovation Incubator, it also enabled collaboration with the university’s Gamification Lab, where the potential offered by games for various areas of society is researched. In addition, the university organised meet-ups with other start-ups and offered advice on legal matters and drawing up contracts. Through this close affiliation with the university, the entrepreneurs were also able to forge contact with partners. The software was first trialled at a grammar school in Lüneburg, for example. For agreeing to act as a pilot school, it can continue using Edkimo free of charge. Today, a good four years after being established, Edkimo has 40 paying customers and the app has so far been used by 7,000 teachers and nearly 100,000 pupils. “Edkimo has become an economically viable business”, reports Zeller, now a member of the management team. “Things are moving forward, albeit not as quickly as we had initially hoped”, she adds. There are also plans to market the app in Austria, France and Switzerland. Edkimo is just one of twelve firms in all that were “hatched” in the Lüneburg Innovation Incubator. In the six years from 2009 to 2015, more than 400 new jobs were created by the start-ups. The Organisation for Economic Co-operation and Development (OECD) was impressed by this result. In its report “Lessons learned from the Lüneburg Innovation Incubator”, the OECD concluded that a regional innovation system had been created. Cooperation between the University of Lüneburg and regional business is also having a lasting impact. Edkimo in any case still has strong ties to the university, and the reverse is also true. Media studies specialist Mathias Fuchs, a professor at the Institute of Culture and Aesthetics of Digital Media at the University of Lüneburg and founder of the Gamification Lab, remains on hand to support the start-up. “Whenever we need scientifically-founded advice“, says Jessica Zeller, “we know exactly where to come for it”.